… It won’t be easy. The list of runners who have withdrawn from this year’s Boston Marathon would make a deep field in itself. Originally, all six U.S. Olympians in the marathon at last year’s London Games were scheduled to compete at Boston. But only two of the six remain. Abdi Abdiraman on Wednesday became the latest to pull out, blaming the flu. He joins fellow U.S. Olympians Ryan Hall and Meb Keflezighi, 2:03 man Moses Mosop, and a few other Kenyan and Ethiopian contenders on the sidelines for Monday’s event. On the women’s side, U.S. Olympian Desi Davila pulled out long ago, and the only sub-2:20 runner in the original field, Aselefach Medessa Mergia, is also out. Shalane Flanagan becomes the first American woman to wear the laurel wreath in 28 years, setting a PR of 2:22. But another 28-year streak remains intact: Sports Illustrated’s consecutive years without a distance runner on the cover (Mary Decker was the last in 1985). Shalane will settle for appearances on David Letterman and the Today Show. Defending champ Sharon Cherop of Kenya and Ethiopia’s Mamitu Daska finish 2nd and 3rd. Kara Goucher is a solid 5th while Stephanie Rothstein-Bruce cracks the top 10 and sets a PR. On the men’s side, Ethiopia’s Lelisa Desisa Benti, a late addition to bolster the depleted field, wins in 2:06. Desisa Benti won at Dubai last December in 2:04:45, and although we don’t trust the incredibly fast times from Dubai, he did look unbeatable in a sprint finish at the end of that race. Kenyan Levy Matebo, who took the lead last year at Boston on Heartbreak Hill before fading to second in the final few miles, finishes second for the second straight year. Ethiopia’s Deriba Merga is third and countryman Gebre Gebremariam and defending champ Wesley Korir fail to make the podium. American Jason Hartmann, who impressed in the heat last year by finishing fourth, is not the top American this time around. That distinction goes to Fernando Cabada who finishes 8th. I’m rooting for Shalane, but just because it would be great to see her win doesn’t mean that she actually will. Given the heat last year, Sharon Cherop‘s victory could be discounted as a mere indicator that Cherop can handle heat better than others, but Cherop also finished third at Boston in 2011. Meseret Hailu Debele has a 2:21:09 PR. It is generally unwise to bet with your heart, but it must give Shalane confidence that Desiree Davila beat Cherop in that 2011 race, and Shalane beat Davila at the Olympic Trials. I’ll take Shalane for the win. Whoever wins the Masters golf tournament will get the SI cover. Cherop gets the silver and Debele bronze. Kara Goucher is a darkhorse here, as she has finished third (2009) and fifth (2011) at Boston, and, with the media focusing on Shalane, is running with nothing to lose. I agree with Gregg that she will finish fifth. Oh the men’s side I’ll take Gebre Gebremariam. I agree that Korir will finish off the podium on the hunch that running for office affected his training. Last year, Gebremariam ran an unthinkably slow (for him) 5k split from 35-40K at Boston of 20:22. His 30-40K was 39:18. Goes to show what that heat did, and what character he had to finish the race (he was 14th, in 2:22:56). He’ll have no such problems this year. In 2011, Gebremariam was third at Boston in 2:04:53, five seconds ahead of Ryan Hall, and he was pipped at the line by Mo Farah in the New Orleans half in late February, finishing in 1:01:00. I’ll go with Matebo for second, and I’ll take a longshot in Jason Hartmann, who finished fourth in the heat at Boston last year and ran 1:01:51 in the cold at the NYC half last month, for the bronze. 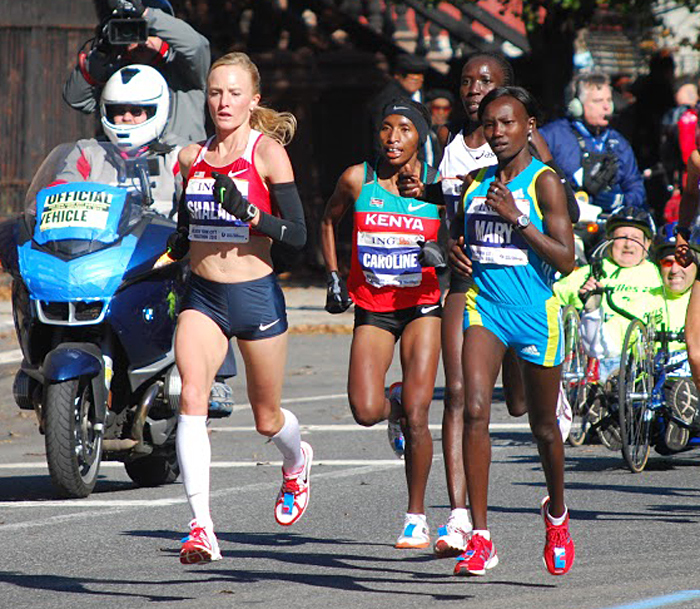 2009 Boston Marathon champ Deriba Merga should be in the mix.